On a daily basis we get asked numerous questions about interactive flat screens and so we’ve put together what we hope will serve to be the ultimate FAQ about flat screens. If you’ve any questions that aren’t covered below feel free to comment below and we’ll get it answered for you then. Now, onto the questions! 1) What Flat Screen Best Fits Our Needs? Having a strategy for how you bring personal tablets into the classroom is paramount – for example you may want to provide each pupil with a specific tablet or operating system that works in harmony with a teacher’s interactive touch screen. Alternatively, you can introduce a BYOD policy allowing students to bring their own compatible device. The latest interactive touchscreens enable greater connectivity between student and teacher devices. The ongoing running costs for interactive whiteboard and projector systems are more expensive than touchscreens, which don’t require costly bulb changes and generally have a longer life. For up to date software, content and apps, it’s advisable to choose the most recent technologies for both interactive touchscreens and personal tablets as these are geared towards collaboration and increased access. A secure Wi-Fi network, device compatibility and retaining a specialist Irish based Cloud provider to back up and store files should be at the heart of your decision making process. 2) What’s An Operating System & Why Does It Matter? 3) How Does Touch Screen Technology Work? Touch technology is embedded in the frame of an interactive touchscreen using either optical cameras, infrared or a combination of the two. As you touch the screen a signal is sent to the frame indicating where it has been touched, allowing the user to control a connected PC or the inbuilt operating system. 4) How Many Touch Points Do Interactive Touchscreens Have & Why Does It Matter? Interactive touchscreens have anything between 4 to 32 touch points depending on the brand and model of the touchscreen. More touch points give the user greater gesture control and, providing the supplied software can support multiple touch points, the best overall user experience. The Clevertouch Plus interactive touchscreen has 10 touch points and multi touch software, which means that a number of people can collaborate on group activities. For example, curriculum based apps can be split on interactive touchscreens so that children can work alongside their peers using a variety of gestures and movements to control the activities on screen without functionality or play being affected. 5) How Reactive Is An Interactive Touchscreen? Can I write normally on it, do I need a stylus or can I use a finger? Interactive touchscreens are very reactive – some more so than others. Before buying, check the responsiveness of the screen to ensure you can easily replicate letters and symbols of varying sizes. When it comes to how you touch the screen you can use a stylus, finger or anything with a soft tip. 6) How Do I Connect To An Interactive Touchscreen? With most interactive touchscreens you simply connect the screen to your PC or laptop using an HDMI or VGA cable and enable ‘touch’ with a USB stick. The Clevertouch Plus range is the first interactive touchscreen to have its own integrated Android operating system, which means it can be used like a giant tablet without a PC. For even greater flexibility, the Clevertouch Plus can also be used in conjunction with a PC or lap top as described above. Having the ability to just turn on and use a touchscreen is a huge advantage and is as easy as using a personal tablet. 7) Are Interactive Touchscreens Affected by Direct & Indirect Sunlight? Because interactive touchscreens are mounted on a wall or placed on a stand in front of a class they often face direct and indirect sunlight throughout the day. For this reason most interactive touchscreens are fitted with anti-glare glass. Ask your reseller or check online for anti-glare specifications. 8) Are Interactive Touchscreens HD? HD is most common however, newer 4K models are available too. 9) How Do Interactive Touchscreens Connect To Personal Tablets & The World Wide Web? With the exception of the Clevertouch Plus, most interactive touchscreens need to be connected to a Wi-Fi enabled lap top or PC using an HDMI or VGA cable to surf the net. You can wirelessly connect multiple student devices to an interactive touchscreen using downloadable software like DisplayNote or the Air Share app. 10) How Complicated Is It To Use An Interactive Touchscreen & Is Training Required? Interactive touchscreens using an Android operating platform will be familiar to most people – they will have used tablets and mobile technology at home. Interactive touchscreens are no different to tablets however, we offer on-site staff training, which can be tailored to meet individual requirements. 11) Can Children Use Large Format Touchscreens Safely & Easily? Interactive touchscreens were primarily designed for use in schools and are extremely strong. Most models come with a 4-5 mm toughened glass screen, which means devices can withstand knocks and bangs directly on the display. 12) Can Interactive Touchscreens & Tablets Improve Children’s Ability To Learn? 13) Can I Use My Current Lesson Plans & Documents In Other Applications Such As Word Or PowerPoint? Yes, by connecting your existing computer to the screen you can view and edit lesson plans and documents controlling the cursor by touch instead of using a mouse or laptop trackpad. If you are using a touchscreen with an internal android operating system and don’t want to connect to a separate PC, you can download an app (e.g. Olive Office) that enables you to open and edit application files like Microsoft PowerPoint and Word. 14) What Apps Can I Download For Tablets & Interactive Touchscreens And Do I Have To Pay For Them? The apps for your interactive touchscreen very much depends on your operating system and the device used. Most free apps contain in-app advertising, which can be avoided by purchasing apps through a vetted supplier such as Google Play Store or the Apple App Store. Apps purchased for the Clevertouch Plus from the CleverStore are free to use and do not contain any advertising or in-app purchases. 15) Can I Write Over Images When Using An Interactive Touchscreen? An on-screen annotation app such as CleverNote from Clevertouch enables users to write and draw over images and save them. 16) Is There Sound & How Loud Is It? Most interactive touchscreens have internal speakers, which are sufficient for typical classroom use. If you want to increase the audio additional speakers or sound bar can be added. 17) Can I Play DVD’s Or Watch TV On It? You can play DVD’s on most interactive touchscreens using a DVD player or laptop with a DVD drive. Alternatively, television and video can be streamed easily on a Clevertouch Plus just as you would on a personal computer, tablet or mobile device. 18) Do Interactive Touchscreens Need Special Wall Fixings Or Do They Come With A Stand? Interactive touchscreens can be mounted directly onto a classroom solid wall or used with a mobile trolley stand. You can control and adjust height screen height on a stand or a wall so that younger students and students at the back of the class can view it. It is important that all interactive touchscreens are fitted by a fully qualified installer as they are extremely heavy. 19) What Happens If Our Interactive Touchscreen Goes Wrong? Check with your supplier or manufacturer – most interactive touchscreens have an extended warranty and on-site de-install/ re-install. For example, Clevertouch troubleshoot over the phone and will send an engineer to fix, remove or replace the device. Most brands offer a support and repair service. 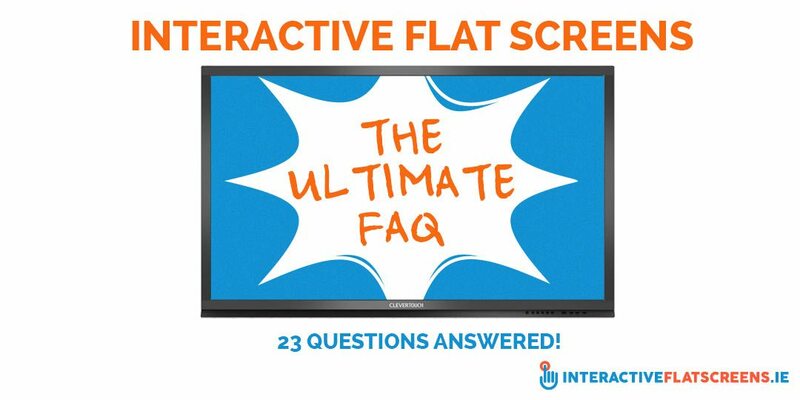 20) How Long Do Interactive Touchscreens Last? Touchscreens last approximately 80,000 hours – that’s equivalent to running 24 hours a day, 7 days a week for approximately 9 years. However, it’s unlikely that an interactive touchscreen would be used this heavily so it should last until you decide to upgrade. 21) How Much Will All This Technology Cost? Call us on 01 4660515 to find out. We have many options and we can supply a custom quotation for you. We even now offer Leasing with our finance partner GRENKE leasing. This allows you to spread the cost over a period of your choice up to 5 years. Thus avoiding the large initial outlay. 22) How Quickly Will Touch Technology Be Superseded By Something Else? Although technology will undoubtedly change, touch technology is unlikely to be superseded anytime soon. The biggest changes will be seen in the way we enable technology, share content and back up, store and access data. 23) What Size of Interactive Touchscreen Do I Need? If you have received a grant and you are considering investing in ICT equipment for classrooms call us and speak to the Educational AV experts. We provide professional Installation and after sales support which is unparalleled. 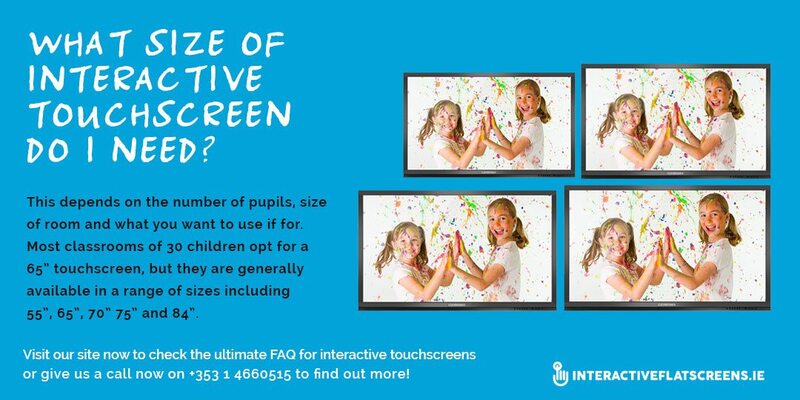 Call us on +353 1 4660515, email me at info@interactiveflatscreens.ie or contact us online!